It was not just another typhoon, it was an exceptionally powerful typhoon that devastated some parts of the Philippines. I was still in Davao when the news broke out that there was going to be a super typhoon coming in and it would probably hit Surigao City. I was kinda worried but some of the team members of #TravelMindanao were already in Surigao City, so the only option really was to take a bus and go to Surigao to meet the team and start our travel advocacy of traveling around Mindanao for almost a month. The weather wasn’t that good when I arrived in Surigao City two days before typhoon Haiyan struck the Philippines. I was not really worried about the typhoon but more worried that the city tour that was scheduled on that day may be cancelled because of the bad weather. Luckily, the weather has somehow cooperated so the tour was pushed through. On our second day in Surigao, we were already worried about the storm so we cancelled our supposed to be island hopping in Bucas Grande, Surigao del Norte. Instead, we decided to stay in a hotel far from the coastal area and in a higher ground. On December 7, 2013, we were already waiting for the storm to hit the country. I’d say we are kinda prepared for it as we have already moved to a safer place. We heard in the news that it will not directly hit Surigao City but we still prepared for it because we don’t really know what would happen. Past midnight, I went out to check the wind and it was already a little stronger than earlier. The typhoon signal was already raised. I woke up at 5AM and immediately opened our room window to check the situation outside. It was bad, the wind was really strong. The sound of the wind was frightening but it did not hinder me from going out and checking what’s going on outside. The road was almost empty. There were a lot of tree branches that fell on the ground. The wind was getting strong. It was a sign that typhoon Haiyan has already made a landfall in the Philippines. It was signal no. 3 in Surigao del Norte. I uploaded a video on instagram right away. I was probably one of the first few netizens who posted a video about typhoon Haiyan online. All news agencies both local and international were very interested to know how the typhoon impacted some areas of the Philippines. 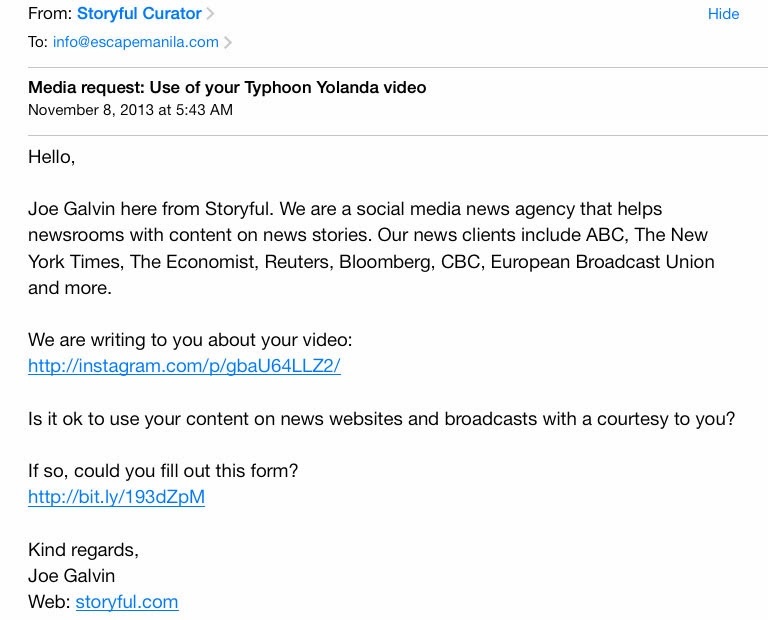 Few minutes after I posted the above video on instagram, Joe from Storyful picked it up and asked my permission to distribute it to news agency. My mind wasn’t working perfectly that time so I misunderstood it and disgregarded his message. It was only late in the afternoon that I realized it’s purpose so I emailed him back and provided my consent to distribute it. Few hours after, I started receiving calls. The first was from BBC UK. I was interviewed about what happened and how it impacted the place I am with. It was a very challenging interview since the signal was pretty bad and of course the British accent of the interviewer was also a factor. Added to the challenge was the absence of electricity in the area I was with. 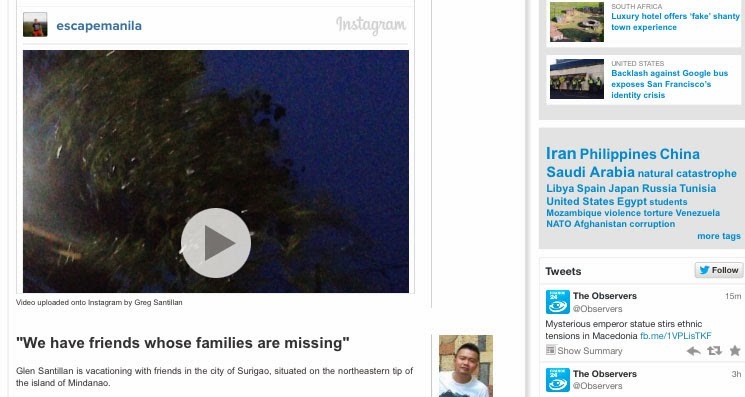 So, I was not able to check on the news on what’s going on in the Visayas and how they were badly affected. 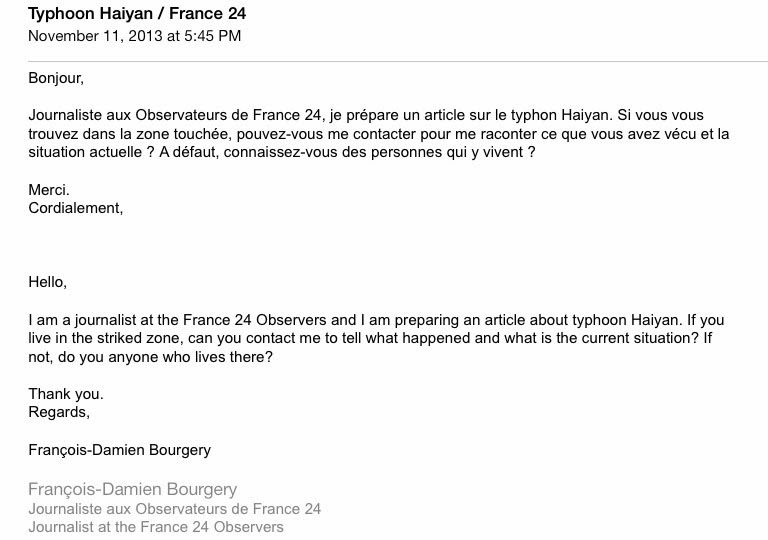 I thought that was it, and then I received another call from France 24, an international news agency based in France. They requested to have a skype video interview. Again it was a challenge as the internet connection was intermittent and the electricity has not been restored yet. Good thing my #TravelMindanao buddies were very supportive. My ever supportive #TravelMindanao buddies helping me out get through the interview with France 24. Thanks to Doi of The Travelling Feet for holding the iPad, Lai of Pinay Travelista for the light, Nathalie for My Wandering Soles for the homestay, Shugah of Wander Shugah for the photo, Jam of Travel Jams and Alex of Bagdok on the Road for the moral support. Past midnight, I was still receiving calls from foreign numbers but I was too tired to answer them. I received three more calls and my phone battery got drained. After I woke up in the morning, I immediately charged my phone from the remaining power from my laptop since the electricity was still not restored. 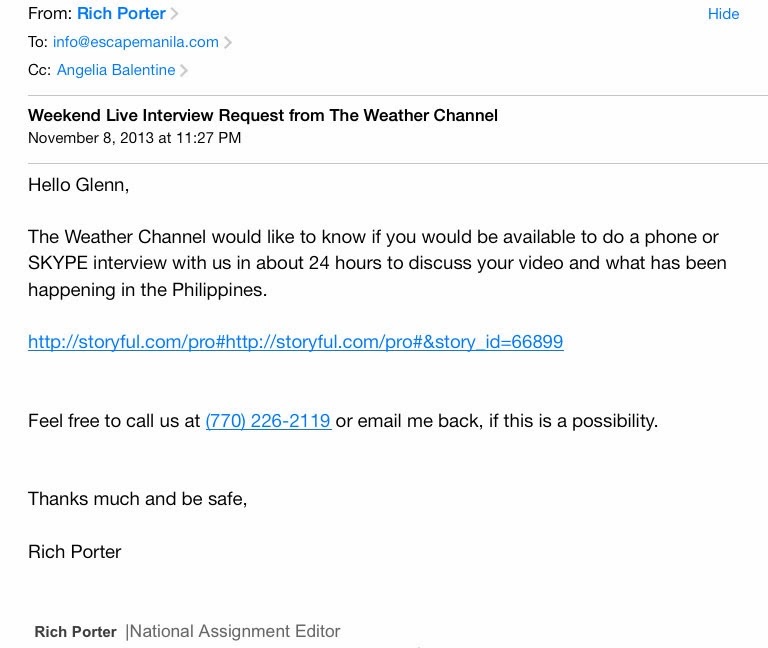 I checked my email and received communication from The Weather Channel and ABC News. In the evening I got a schedule for a live phone interview with The Weather Channel for its Weekend View show. They initially requested for a video skype interview but due to very slow internet connection, it was not possible. Below is a video clip of my interview. I was invited for another interview for another show at The Weather Channel but again I was too tired so I politely declined. So that was it. That summed up what we went through when typhoon Haiyan hit the Philippines.